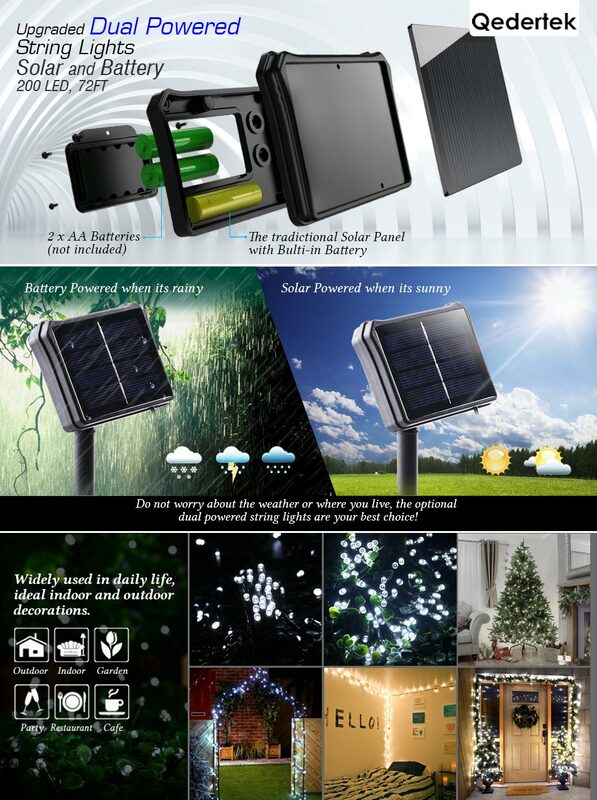 World First Daul Powered String Lights - Solar powered when it is sunny, battery powered when it is rainy and snowy, ideal daily decorations for indoor and outdoor, Easter Day, Party and Holidays. Optional power supplying, the first design in the world! Solar powered when it's sunny; battery powered when it's rainy! 200 LED mini lights on a 72ft string, decorates your home and garden with cool white light, brighten up your parties and your world all year round! Two buttons on solar panel(Power ON/OFF, Light Mode), sensor technology inside the panel, auto-on at dusk, auto-off at dawn.